Discover de La Caldera de Taburiente Camping Site in La Palma and how to book your stay. 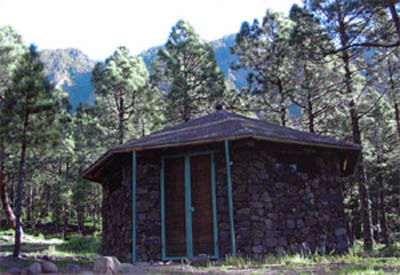 This camping site is located in the heart of La Caldera de Taburiente National Park in the municipality if El Paso on the island of La Palma. It has capacity for more than 100 people with a surface of 15,000 square meters. Camping here is one of the best options if you’re looking for a close contact with nature. From here many hiking trails start. It’s also much appreciated by those looking to meet the island. Every year hundreds of walkers stop here to have a new experience on this island. It’s important to know that you can only stay up to two nights here. Also, it’s indispensable to book previously through the phone number +34 922 497 277. To obtain a camping permit you should go to the La Caldera de Taburiente Visitor’s Centre, located on the carretera general padrón, 47 – El Paso. The opening schedule is from 9am till 2pm and from 4pm till 6.30pm. It’s possible to ask for the camping permit in advance through the phone number, but you’ll always need to go to the visitor’s centre to pick it up personally. It’s important to know that it’s possible to have guided-trips from 5 people or more. This is a free trip. Carretera general padrón, 47, El Paso, La Palma. From 9am till 2pm and from 4pm till 6.30pm.